Temperance (R) says you have gone to extremes – recognize this lack of harmony. Stop and consider how things are going in your life. Frustration causes emotional stress, your judgment is then lacking – you need to look before you leap. Slow down and re-evaluate every thing – a different approach is required. You have lost sight of your “art”, your genius, your creative talents and your energies are being wasted and scattered. You are focused on the stress created by the conflict you are experiencing – forcing the issue is not the answer – you need total change. Seek the advise of your “inner” Self – allow yourself to be quiet, experience the stillness – listen and the answers will be provided. Your inner self is always present and dependable – it is your true reality and when the time comes for you to find out who you are – the Voice inside of you will tell you who you are. Your experiences give you the material and data you need to make your decisions. Determine the course of your life – not the course that others desire for you – but the course that is right for you. There are two sides to everything – the straight reasoning side and the “feeling” elements and both must balance – you can not have one without the other. It is time for you to become involved in the “outer” expression of your “inner” ideas. Each experience will tell you something new – allow yourself to flow with the experience and be led by your inner voice. When the time comes, you will know exactly what to do. It is through your “inner” awareness that you will know what is the appropriate action to take in any situation. Allow your old fears and habits to die away into the past. Calm down, avoid extremes and use the balance you have so carefully developed. Notice that “love in its lower manifestations turns into law by forming habits.” A problem of giving or taking in healthy proportions. In a sense this card functions as an emotional barometer. Not being able to take is a problem for many and is little recognized in modern society, where giving has received a “good” label and taking has received a “bad” label. You must learn to be a good taker or you will be denying others their right auld pleasure in giving. There can be too much mentality creating abstraction and limiting heart. Too little mentality in the emotional. What are you feeling optimistic about? How are you combining the resources available to you? What are you testing or trying out? What needs to be healed or brought into balance? In the first position: This emotional insistence on balance gives this path a steadfast quality that will help it weather many a storm. In the second position: At one extreme, you are over concerned about doing too much and do not allow yourself enough range for experience. You may be considered dull because you simply refuse to do anything extraordinary. At another extreme, you are inconsistent and your actions cover a wide span. In the third position: This energy of Temperance will work through you for someone close who needs the healing balance. Direct your mind and heart to this task. In the fourth position: At one extreme, this can demand a sameness as opposed to an equality, or be intolerant of imbalances in the short run, destroying rather than fostering caring love. 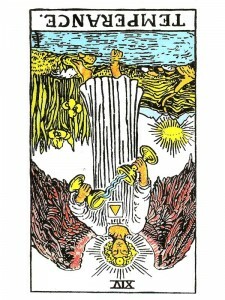 In the fifth position: The mind can only address the issues here; the real work will still have to be done by the heart. The mind may be subverting or distorting knowingly the emotional issues at hand, and contributing to the problem. In the sixth position: An imbalance of this principle may put your relationships, or your creative endeavors, to the test. Habits may become destructive. As a preventive measure ask someone on whom you can rely to give you brutally honest feedback on your behavior for awhile, and then listen to them. In the seventh position: You may think of temperance as a weakness. You may even have a fear of compromise. In the eighth position: Your action may be an over reaction. Reconciliation may be inappropriate or it may not be going well. Physical habits may be out of control; substance abuse appears here, with resulting damage to the body. In the ninth position: With temperance, timing can be a problem. As we identify an imbalance we want to correct, we may not wait for the appropriate situation. Give and take requires willing parties on both ends whose souls have complimentary needs at the same time. In the tenth position: The above is true, but in order for you to have the energy and motivation to help someone else get their project accomplished on time.